Chile is a adventurer’s paradise. This country has it all – high snow capped volcanoes, thousands of acres of untapped wilderness, granite spires, glaciers, and some of both the driest and wettest places on earth. Making this list was particularly hard because there were so many good places that ended up left out. You could spend your entire life here and not see or do it all. In 2017 I was fortunate enough to spend multiple months in Chile where I explored much of what the country had to offer. So, full disclaimer, this list is in no way complete. However, I found these three places to be of exemplary quality and therefore, a must visit for any adventure traveler. Starting off the list we have the beautiful Canjon del Maipo. Located just outside Chile’s capital of Santiago, it is a popular destination for travelers and local Chilenos looking to escape the urban sprawl of the city. This location is a great place for many adventure sports including white water river rafting, which is particularly popular. Fortunately there is also a lot of easily accessible climbing only a few hours outside of Santiago. 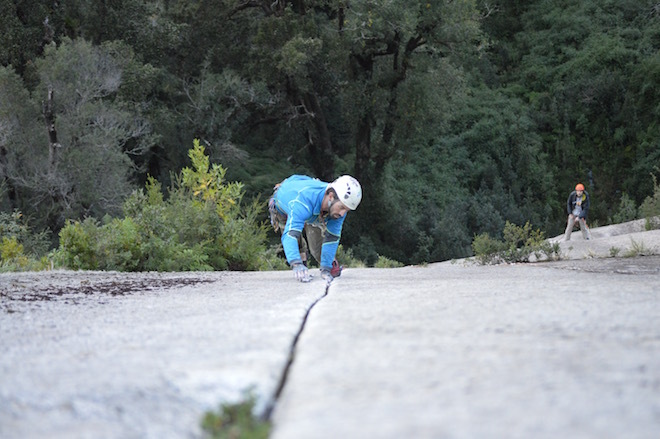 El Canjon has around 13 different crags of various differing styles and difficulty. The most popular is Las Palestras due to its relatively close proximity to Santiago (only about 1hr) and its good variety of routes. However, if you have the time, the best climbing in the canyon is without a doubt La Mina. Unfortunately, it is also the farthest from the city (around 2.5hrs). That being said, if you make it out, you won’t regret it. The rock is super high quality, the routes are long, and the scenery is beautiful. Keep in mind when considering this location that this is an advanced crag, with very few routes below 5.12a. I would not consider the climbing here or the other areas around Santiago to be of world class climbing. However, as far as climbing near a major metropolitan city goes, Santiago is one of the best. If you’re going to Chile it is very likely that you’ll at least pass through Santiago. If you have a day or two to kill, I suggest checking it out. More can be found on the climbing around Santiago in: “The Top Climbing Towns in South America”. Summer is the driest time of year but also the hottest. Temperatures regularly reach in the 80-90 degrees area. The winters on the other hand can get very cold and snow is common. For that reason I would suggest the shoulder season, especially spring (Sep-Nov) because of the milder temperatures and relatively little rain. But if you’re keen the climbing here is pretty much year-round. You’ll just want to pay much more attention to the exposures. At El Canjon’s high elevation, the sun is very strong, and on clear days in the winter the sun can still warm up the rocks. Due to Chile’s great infrastructure, arriving to El Canjon is easy. Coming from the city, take the L4 line to the last stop (Puente Alto). Leave the station and look for the colectivos. Ask around and you’ll soon find the ones going to El Canjon. Depending on what crag you’re going to you’ll have to tell the bus driver where to let you off, which could be a bit difficult (he’s not going to know where the climbing is). In the case of Las Palestras, you can tell the driver to let you off at Los Puemos. The exact location of the climbing can be found here. Once you’re in town, look for a dirt road which takes you up the hill towards the climbing. The path is on public land and usually you have to pay a small entrance fee (around 1$) to go through. To arrive a La Mina, you’ll have to first reach the town of Banos Morales. Luckily, because it is a tourist town it is quite easy to find a bus. You’ll have to ask the bus driver of the first colectivo where he’ll be letting you off, and it is unlikely that he’ll take you the entire way. Ask around, and the friendly locals will point you in the right direction. Once you get to the town, the climbing is easy to find. Simply walk east out of town and you’ll soon find a the path. The exact coordinates of the crag are here. 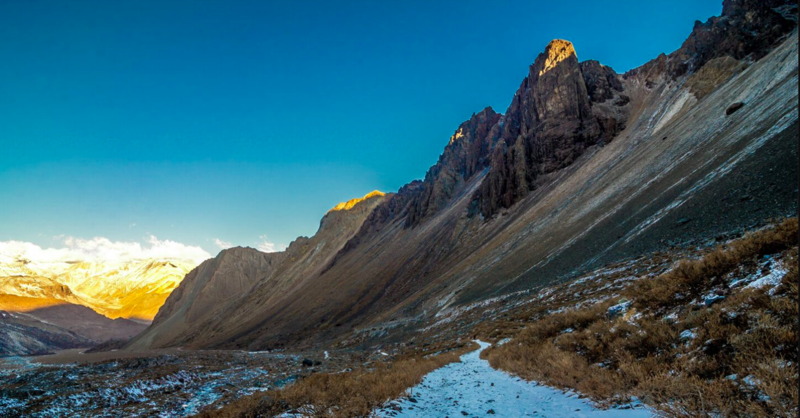 Located high in the Andes Mountains sits the Valle de Los Condores. 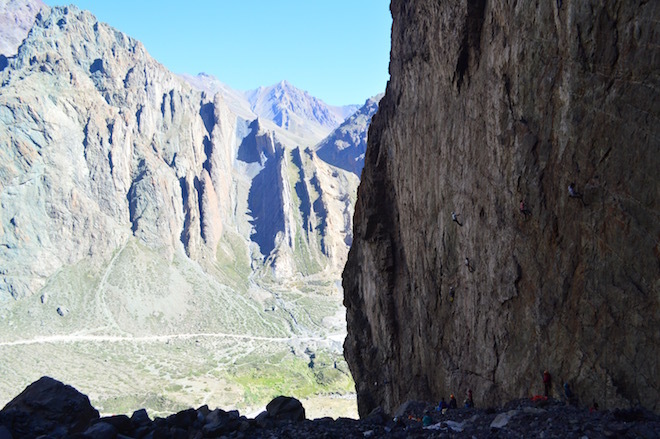 The setting here is absolutely spectacular, and is surrounded by some of Chile’s best climbing. The area first gained a lot of international recognition after it was the location for the 2017 North Face Rock Trip, and was visited by some world famous pros such as Alex Honnold and Alex Megos. 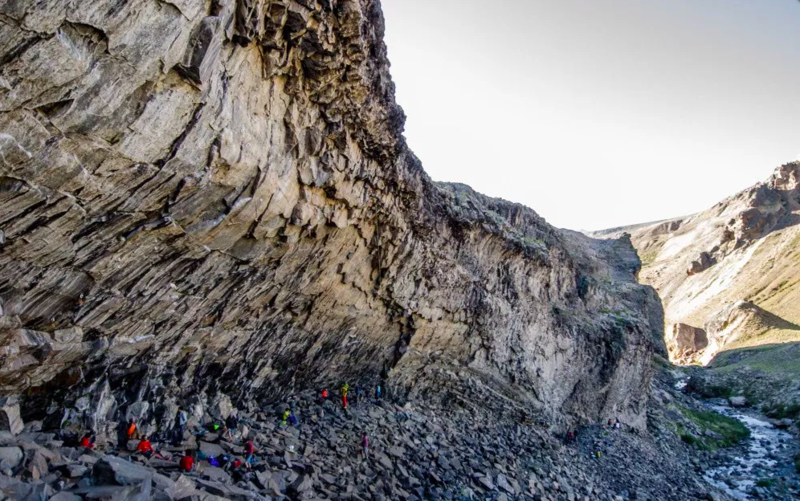 The area received possibly even more fame in 2018 when the area was visited by the world’s strongest climber Adam Ondra. The rock consists of high quality compact basalt. 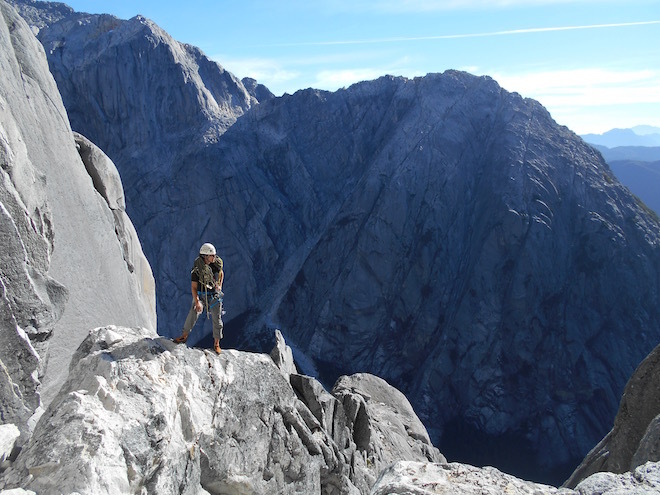 Not only are there sectors of columns perfect for trad gear, but there is also lots of very steep juggy climbing. 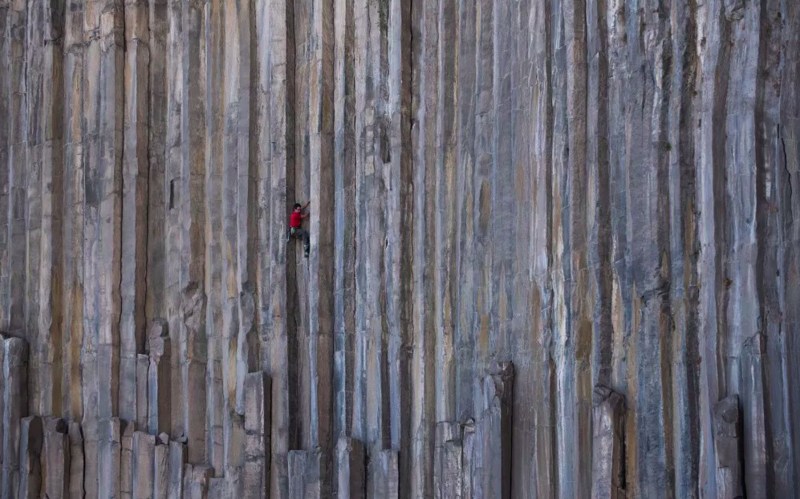 This is rather uncharacteristic for basalt and makes for some really fun climbing that will keep you occupied for weeks. You will find at this location a few hundred high quality routes, with massive amounts of potential for development. The rock quality is bomber and there is a good mix of styles and grades as well. The setting is also stunning, with no town anywhere near the climbing. It is unlikely that you will see anyone there other than climbers. Keep in mind that as typical of any high altitude location, the elements here are strong. Expect brutally cold winds at night and powerful sun during the day. The camping is very exposed, without any real forms of protection against the elements. Come prepared or you will have a very long trip. Arriving here is a bit of an adventure in itself. If you don’t have a car, first take a bus to the town of Talca, Chile. From there take a bus from the main terminal towards La Mina, and ask to be let off a the last stop. This last stop will be located about 107kL up on the Highway 115. From here you’re going to have to hitchhike or walk the rest of the way towards the climbing. The camping spot in front of la gran pared (Big Wall) can be found here. Similar to most spots in Southern Chile, the climbing season is Oct-April, depending on your tolerance for bad weather. 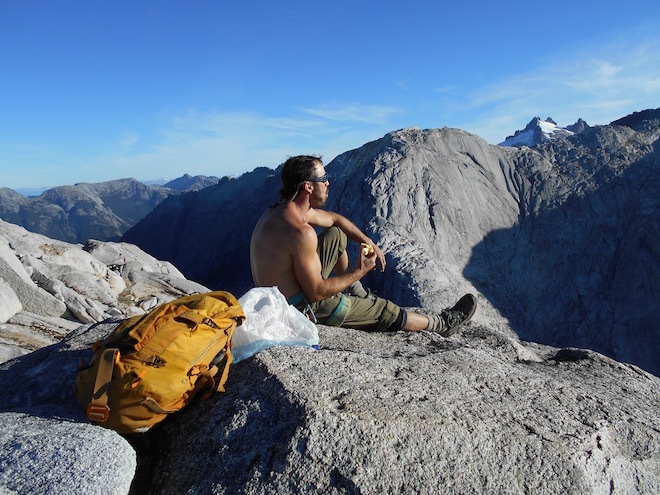 The best weather is most certainly going to be in the summer, and, due to the high elevation, the temperatures stay pretty manageable during the days, especially if you climb in the shade. As the temperatures lower, you can switch to climbing in the sunny exposures during the days, avoiding the shade. Just make sure you have proper gear… that wind is so cold. This location is Chile’s granite paradise. Here in the Patagonia wilderness spectacular mountains of rock pour up from the grounds towards the sky. The wilderness is untouched. The days are long, the rock is perfect, the people are friendly, and the climbing is amazing. 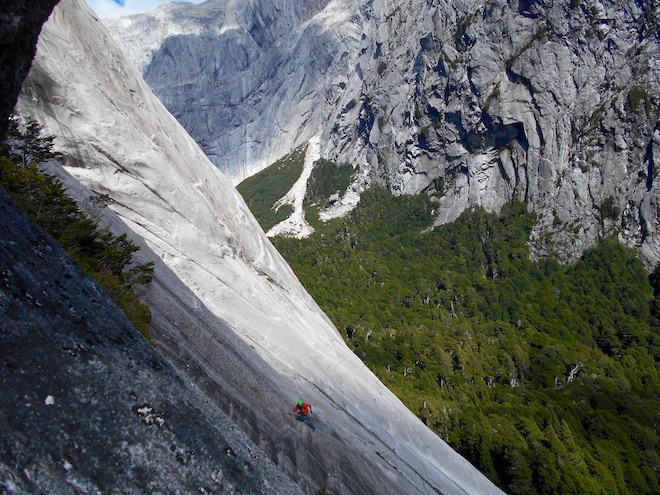 This is a world class climbing destination which is rightfully called “South America’s Yosemite”. That’s a bold claim, but as it turns out, Cochamo can back it up. Now keep in mind that this is not a beginners climbing area by any means. 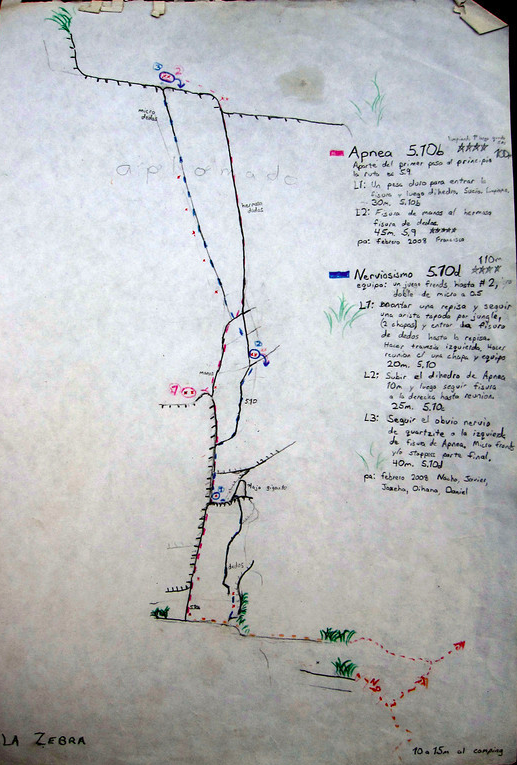 The grades here are stiff, the routes are long, and the location is remote. If you get seriously hurt, it’s going to be very hard to get yourself out (for that reason Cochamo sees numerous helicopter evacuations each year). You should be able to lead at a minimum 5.10 trad comfortably with hundreds of meters of pure exposure under your feet. Cochamo is Yosemite 40 years ago. The walls have seen some impressive development over the past 10 years, but there are still thousands of lines ripe for the taking. That’s right, thousands. For that reason every season the valley sees more and more development from climbers eager to etch their names into this place’s history. The next Astroman is there… go out and find it! After Alex Honnold’s 2013 visit, supposedly he thought it was the best climbing in South America. I guess he knows what he’s talking about. When I try to describe Cochamo words such as: magical, beautiful, epic or perfect all come to mind. No blog post can, or ever will, truly give a place like this justice. The only piece of advice I can give you is, if you have any inclination to go here, don’t think, just do it. In 2016-2017 I traveled and climbed for 8 months exclusively in South America. After visiting 9 countries and seeing some of the best the continent has to offer, this place stood out in my mind as, without a doubt, the best place I climbed and one of the most beautiful places I visited. To reach this location, first you’ll have to take a bus to Puerto Montt. From there you can catch a daily bus towards the town of Cochamo. You’ll have to tell the bus driver where to let you off (they usually know where the gringos are going), as the trailhead is about 15 minutes after the town itself. 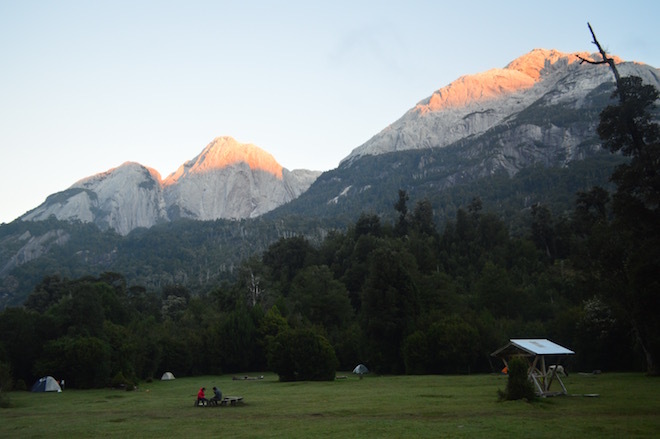 From that stop you’ll have a 4 hour hike to the Cochamo camping areas. Be warned that this trail gets extremely muddy. You will be able to hire a mule to help carry your equipment and food if you wish. Cochamo is a strictly pack-in, pack-out place. There is ample drinking water on the way, but all your unused food and waste will have to come back out with you. 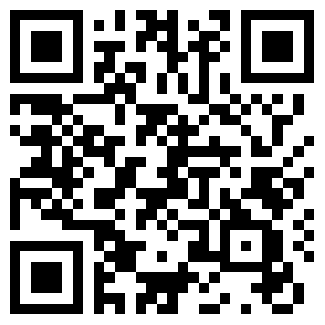 There are a number of different campsites to choose from. Here you’ll set up a bit of a ‘base camp’ where you can plan your climbing missions. La Junta is probably the most popular and the ‘best’ spot to stay for climbers, as they have all of the route topos and beta printed off for you at the refugio. Cochamo is a summer only location. Even in the summer, rain storms are common, and become increasing so as the winter approaches. That being said, it is common for week long rainstorms to come out of nowhere in the middle of the summer. Though this is some of the best climbing in the world, due to its remoteness and difficult access, the area doesn’t get flooded with climbers. Imagine Yosemite without having to line up for the routes? Back to top of post. 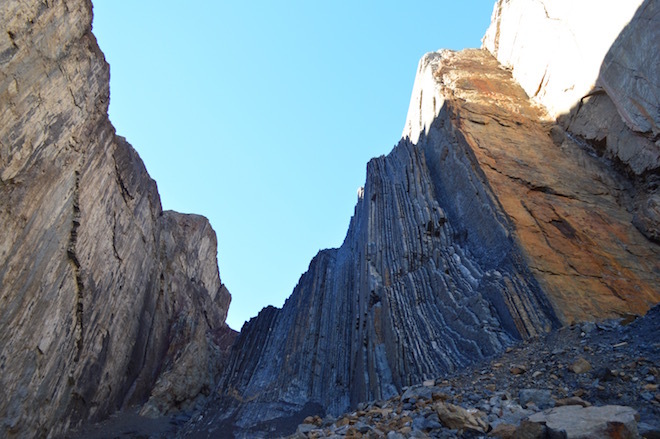 For more reading like this see: “Trip Report – Cochamó – South America’s Yosemite” and “The Top 6 Rock Climbing Towns in South America“. Rock Climbing Argentina: Piedra Parada – Everything You Need to Know to Go!